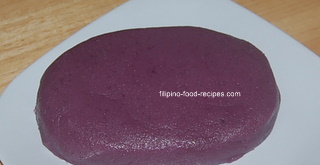 Halayang Ube or Purple Yam Ube dessert is quite common during holidays, town fiesta (feasts) and special occasions. The preparation is quite easy, the tedious work is in the mixing on the pan until all the liquid has incorporated into the yam and it's thick and sticky. 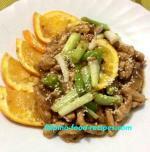 The texture is a little chewy and creamy, and the flavor of the Ube should stand out. It is sometimes topped with latik, made from continuously reducing the coconut cream until the remaining curd gets fried from it's own oil. Some commercially prepared Halayang Ube use all-purpose flour as thickener. The texture is quite different and the Ube taste is not so pronounced so it's easily noticeable. 1 Cut the boiled and peeled Ube into 2 inch cubes. Using a potato masher or potato ricer, mash until smooth and no chunks are visible. See Cook's tips below for an alternate process. 2 Mix the ingredients in a pan, leave out 1/4 cup butter. 3 Cook stirring continuously on medium heat until the liquid is reduced and fully absorbed by the yam, about 5-10 minutes. 4 Turn the heat to medium low and continue stirring until you get a very thick consistency. 5 Brush your serving pan or container with remaining butter and spread out the Halayang Ube. The butter will prevent it from sticking to the container. 6 Cool and refrigerate before serving. For easy mashing of the Ube root, put it in the food processor and put a little coconut milk, or you can use a Portable Stick Hand Blender and you can mash it directly on the pan. Back in the Philippines, my mom used a grater for the ube since we never had a potato ricer, masher or food processor. Using a grater is quite tedious but if it's all you have, that will do the job just as well. Use a teflon or a non-stick pan when making this dessert. It's much easier to handle the mix especially towards the end of the cooking process when it's all sticky. Add a pinch of food coloring if the ube you bought is not very purple. Mix blue and red to get purple, and add it to the coconut milk so you don't get a blob of undissolved food color. Salt is an important ingredient for any sweet dessert, cakes or pastries as it brings out the sweetness and enhances the flavor of any dessert.